Digital files can be easily uploaded via Upload Files. If you have numerous or very large files it may be more efficient to post your discs or USB sticks. However, we ask that all jobs be booked in prior to them being posted to ensure we have capacity to meet your turnaround requirements. 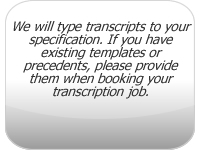 Complete Verbatim – used in court, police and other legal work and also for analytical purposes in university research. This level of transcription is the most time-consuming and includes everything that is heard: false starts, stutters, interjections and repeated words and phrases such as 'you know' and 'kind of'; all non-verbal sounds such as 'uh', 'um'; coughs, laughs, pauses, and noting when people enter or leave the room. Smooth Verbatim – used in general research interviews, lectures and focus groups. Eliminates all non-verbal sounds, stutters, interjections, repeated words and phrases, idiosyncratic speech and irrelevancies.